Aukse and Kas make such an adorable couple! We met Aukse through her friend who was the maid of honor of another bride who bought her beautiful gown at my wife's bridal shop The Ivory Suite. They are so fun loving, and the camera loves them! They wanted a beach location for their engagement session - that's the great thing about living in SoCal, lots of scenic beaches to shoot at. We ended up shooting on a Sunday morning at 8:00am, and they were great sports about the early shoot time. We had loads of fun and starting so early, we didn't have to worry about the crowds. Their Lithuanian wedding ceremony will be at at Saint Casmire's Church, and their reception will take place in Downtown L.A. at the Los Angeles Athletic Club. We will also be posting photos from their wedding soon! We're kicking off our busy wedding season with a lot of engagement sessions! 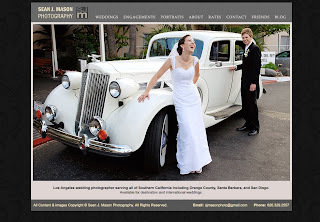 Lauren and Cooper will be getting married at the Newland House Museum in Huntington Beach. This fantastic couple are so fun to be around, and great to work with. We will be posting photos from their wedding soon so keep a watch out for them! Happy New Year everyone! We look forward to another very exciting year in 2009. We are getting busier than ever which we are so grateful for. The other good news is that we will NOT be raising our rates in 2009! We are keeping our low and very reasonable 2008 rates, which I am sure you are excited about. :) We look forward to meeting you in this New Year of 2009! Oops, I am a little behind on blogging!